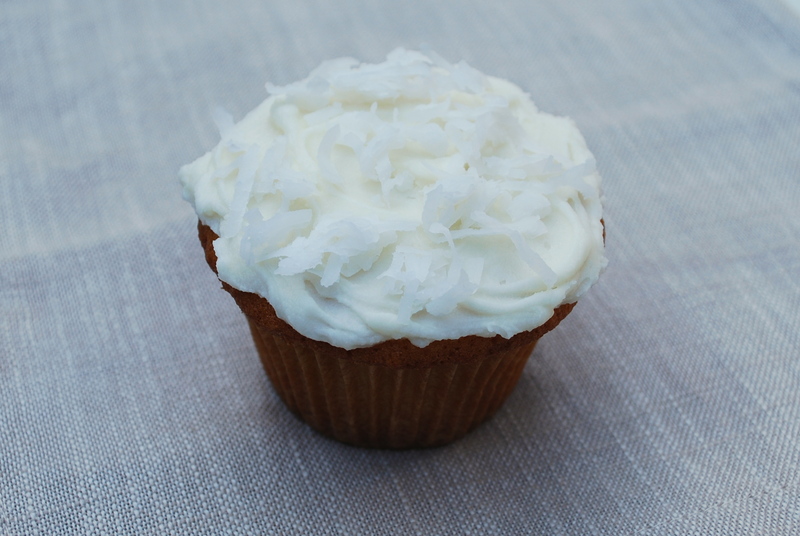 Coconut Cupcakes | Time to Cook! These cupcakes are delicious and because of their all-white coloring and coconut topping (which looks like confetti), they are perfect for a special celebration (birthday party, baby shower, engagement party, Easter, etc.) They are always a hit. I did learn a lesson while making these once though. While making my batter, I was cracking the eggs directly into the bowl, and I got a little shell in there. For the life of me, I could not fish it out. I just continued on, forgetting all about it… My husband ended up bringing in some cupcakes to work (so we didn’t end up eating all of them ourselves) and later that day, his future boss appeared at his door. He said he really enjoyed the taste of the cupcakes, but next time would prefer them with no egg shell. I was pretty mortified when this got relayed to me! Ever since then, I’ve taken the time to crack my eggs into their own little bowl before adding them to my mixture! Note: if you don’t like the taste of almond extract (I don’t), you can substitute with more vanilla extract. Recipe from The Barefoot Contessa Cookbook by Ina Garten.